Defense Secretary Robert M. Gates said Wednesday that the relatively low levels of violence in Iraq and improved cooperation of late between U.S. and Iraqi forces have raised the possibility that commanders might be able to “modestly accelerate” the reduction of U.S. forces this year. 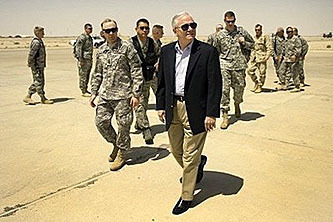 ….Gates said if trends throughout Iraq remain generally positive, the United States could withdraw three combat brigades, each consisting of about 5,000 soldiers, from Iraq this year. The existing plans call for two brigades to be withdrawn. When the shooting subsided, another confrontation began. A senior Iraqi army commander who arrived at the scene concluded that the Americans had fired indiscriminately at civilians and ordered his men to take the U.S. soldiers into custody. The U.S. military said the soldiers had acted in self-defense and had sought to avoid civilian casualties; U.S. commanders at the scene persuaded the Iraqis to back down. ….Word of the incident quickly spread among U.S. soldiers in Baghdad. Several said it heightened concerns that the split-second decisions they make now have the potential to draw a sharp rebuke from Iraq’s increasingly assertive security forces. And reaction from Iraqi military officials seemed to confirm those fears. These things might be entirely unrelated. Gates himself implicitly dismissed the incident by saying, “There clearly will be the occasional hiccup by someone who doesn’t get the word.” Still, if violence is generally under control and Iraqi commanders are starting to harass American troops, that might make quick withdrawal into a more welcome option than it would be otherwise. Just a thought.